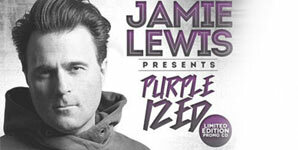 Stand out Swiss DJ/producer and record label owner Jaime Lewis releases 'Purplized' on his own label Purple Music. With his partner Manuela De Pasquale, this duo is certainly making big waves in Switzerland bringing some amazing artists to their label and creating great parties across Europe. Lewis has been in the game for a long time, spanning a 20 year DJ career and having released some smash dance singles featuring Prince, it's time bring 'Purplized' to the masses.